Seymour, who is an orphan and is also a nerd, is taken in by Mr. Mushnik. Mr. Mushnik is the owner of a run down Florists in the seedy part of town. It is in this shop that he gives Seymour a job. Seymour has a very big interest in strange and interesting plants, especially exotic ones. He spends a lot of time studying them and learning about them. Seymour spends his time in the shop doing menial tasks such as sweeping the floor, cleaning the shelves, wiping the windows etc. He also dreams of the shop assistant, Audrey. The shop is not doing well at all. It is hugely lacking business and is in danger of closing down. One day, just after an eclipse of the Sun, while out and about on the streets, Seymour discovers a strange plant that appears on a market stall. 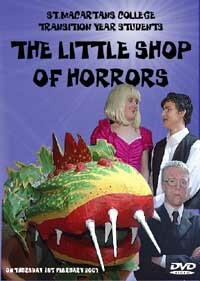 He buys it from the seller at the stand and names it Audrey II, after Audrey, the shop assistant. The plant soon attracts business and publicity for the shop. While caring for Audrey II, Seymour discovers the plant's rather unique appetite. The plant grows and grows, as does Seymour's infatuation for Audrey, but the plant soon begins to control his life. How will Seymour satisfy the plant's needs? How will he take back control of his life? !